The Lakers come to Denver tonight attempting to hold on to the second best record in the league behind the Cleveland Cavaliers. Los Angeles hasn’t played since Sunday’s loss at home by 19 points to the San Antonio Spurs. With four losses in their last six games, LA needs to come out strong tonight and build some momentum heading into the playoffs. Center Andrew Bynum has missed LA’s last eight games with a strained Achilles’ tendon and will not be suiting up for tonight’s contest. Struggling to compensate for his productivity, the Lakers are 4-4 without their 22-year-old big man. On the other hand, the Nuggets are on a three-game winning streak after rallying to beat Kevin Durant and the Thunder last night in Oklahoma City. They outscored the Thunder by 11 points in the fourth quarter to win 98-94 and now stand tied with Dallas for the second best record in the Western Conference with four games remaining in the regular season for each squad. 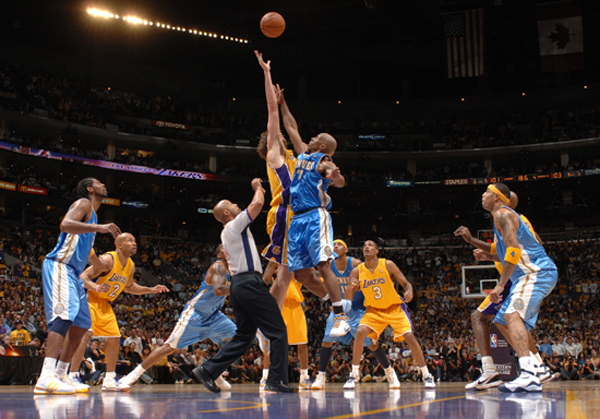 The Nuggets are 2-1 against the Lakers so far this season, winning by 26 and 13-point margins in their two victories. With Carmelo Anthony, third in the league in scoring at 28.4 ppg, and savvy, championship veteran Chauncey Billups running the point, Denver is bolstered by a fearsome twosome who are healthy and ramping up for their playoff run. The Nuggets had a scare last night when Anthony briefly lost consciousness after banging heads with Durant in the third quarter. But fortunately he returned to play in the pivotal fourth quarter and appeared in good form. The Lakers must win their final five games this season to reach the 60-win plateau for the second straight year. The last time LA accomplished this impressive feat was when they did it four consecutive seasons, starting with the1984-1985 campaign. More importantly, LA must keep winning in order to secure the second best record in the league and solidify home-court advantage over the Orlando Magic should a rematch of last year’s Finals occur. Marv Albert, Reggie Miller and I have the call on TNT tonight at 10:30 PM ET.